If you’ve been following the Republican Presidential Debates, chances are you’ve heard plenty of talk of “job killing” environmental regulations. That talking point reflects a widely accepted belief that protecting the environment and expanding economic opportunities are conflicting goals. Robert Pollin (PhD Economics ’82) isn’t buying it. Armed with hard numbers, original research and studies from across the political spectrum, The New School alum takes on the myth of environmental protection being at odds with economic prosperity. Pollin, Distinguished Professor of Economics and Co-Director of the Political Economy Research Institute (PERI) at the University of Massachusetts-Amherst, will make his case during a talk, Greening the Global Economy, at The New School’s Bob and Sheila Hoerle Lecture Hall, 63 Fifth Avenue, on Wednesday, Dec. 2, 2015 at 6 p.m. Katrina VandenHeuvel, editor and publisher of The Nation, will moderate the discussion, and Joel Towers, executive dean of Parsons School of Design and associate professor of architecture and sustainable design, will make comments. 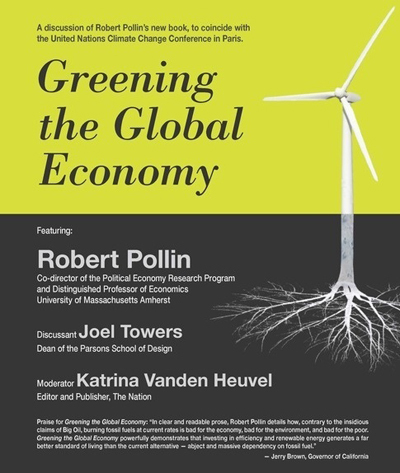 In his book, Greening the Global Economy, Pollin demonstrates the limited impact environmental protections, including policies to address global climate change, have on economic growth. “The global economy can achieve the emissions reduction target if most countries devote between 1.5 and 2 percent per year of GDP to energy efficiency and clean, low-emissions renewable energy sources,” he says. What’s more, Pollin asserts, working people throughout the world will benefit from the overall growth in job opportunities generated by clean energy investments. Selected by Foreign Policy magazine as one of the “100 Leading Global Thinkers for 2013,” Pollin has worked recently as a consultant for the U.S. Department of Energy, the International Labour Organization, the United Nations Industrial Development Organization and numerous non-governmental organizations in several countries on various aspects of building high-employment green economies. He also has directed projects on employment creation and poverty reduction in sub-Saharan Africa for the United Nations Development Program, and he has worked with many U.S. non-governmental organizations on creating living wage statutes. He also is the founder and president of PEAR (Pollin Energy and Retrofits), an Amherst, Mass.-based green energy company operating throughout the United States. To RSVP to Greening the Global Economy, contact Theresa Solinger, The New School for Social Research, at solinget@newschool.edu or 212.229.5662 x3830.